The NATO exercise Trident Juncture 2015 will take place during October 2015 and until early November in Italy, Portugal, and the State of Spain. According to a variety of sources, this will be the “largest exercise of NATO since the end of the Cold War”1, “largest exercise conducted by the Alliance since 2002” (…) and “the Alliance’s most important exercise in 2015”2, or “the largest deployment of the Alliance in the last decade”3. The exercise consists of two clearly distinguished phases, a command post exercise (CPX, 3-16 October) and a phase of real action (Live Exercise, LIVEX, 21 October-6 November). By Pratap Chatterjee, originally published on the Corporate Watch blog. We live in a world where people profit from war. In 2014, Global military expenditure was estimated to be $1776 billion. Lockheed Martin - the world's biggest arms company - sold more than $45.6 billion worth of equipment. The war in Iraq wrenched open the country's economy to contractors of all shapes and sizes. Arms companies profit from every bomb that falls, and every bullet that's fired. Through occupation, companies have the opportunity to exploit cheap land and lax labour laws. Conflict zones give fossil fuel giants access to new resources to exploit. Militarism means that research funding goes towards developing weapons of war, not finding solutions to global challenges like climate change. Wendela de Vries describes the action Stop Wapenhandel took against the presence of Dutch companies at the IDEX arms fair. Thank you, Javier – vaarwel, adiós and au revoir! 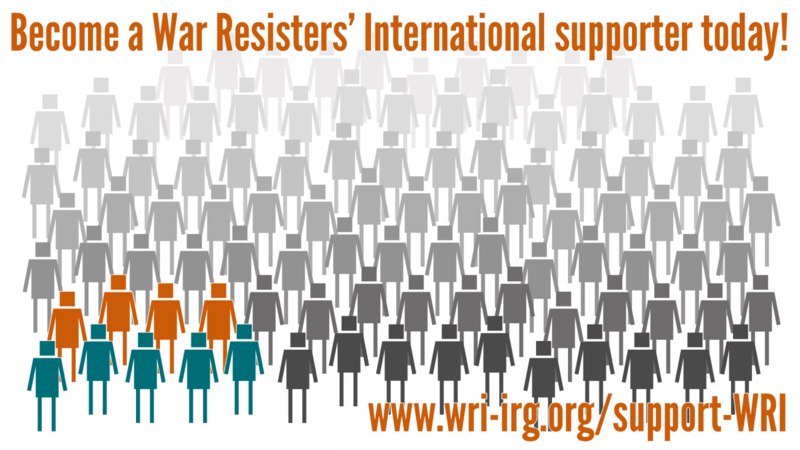 After ten years Javier Gárate, WRI's first ever Nonviolence Programme worker, is leaving WRI. When Javier started, there was little else than an old computer and WRI’s track record in nonviolence trainings to help him bring together this programme. He has done so very successfully – numerous international trainings for activists, trainings of trainers and two issues of the Handbook for Nonviolent Campaigns stand for Javier’s achievements in those ten years. Plus of course three "quadriennials", in Germany, India and South Africa, which Javier together with his co-workers played a crucial role in preparing and conducting successfully. Javier is moving to Belgium, but will continue to participate in some of WRI's regional networks. So we have reasons to hope that this good-bye is also a "see you soon again". We thank Javier very much for his untiring work, his friendliness, his kindness, his dedication, his humour and his keen commitment. WRI has gained so much from your time in the office, and we hope WRI has given you a lot, too. Javier – vaarwel, adiós, all the best and au revoir! On January 5 I was part of a small group of four people that entered RAF Waddington, the home of UK drone warfare, to protest the growing use of armed drones. British RAF pilots began operating armed US Predator drones in Iraq just over ten years ago before the UK acquired its own Reaper drones in 2007 for use in Afghanistan. Since then UK pilots have launched hundreds of drone strikes in Afghanistan before returning to Iraq, in November 2014, to begin launching strikes there once again. Along with the US and Israel, the UK is a key proponent of the idea of remote ‘risk free’ warfare. In Venezuela, the left and the right agree on one thing – it is a country which is very rich in oil and mining reserves which must be sold as quickly as possible, ignoring the social and environmental consequences of further using the development model based on extractivism.